Image source: John Tewell on Flickr. A 1902 publication entitled “A Pronouncing Gazetteer and Geographical Dictionary of the Philippine Islands1” devoted an entire section to the Province of Batangas, and it is from this that we are able to extract historical information about the state of the province’s 22 towns at the time. The year 1902 was still at the dawn of the American colonial era in the Philippines and was, in fact, the year when the Philippine-American War ended. Thus, publications such as this were essential as the American government was still eager to introduce its new “acquisition” to its public. It was also a necessary for American citizens who would be making the trip across the Pacific to take up various public and private positions as the United States started to administer its new colony. The province was presented as having a total land area of 1,108 square miles (compared to the present day’s 1,204.54 square miles or 3,119.75 square kilometers2), with a population of 311,180 (most probably inaccurate). Its name was supposed to have been taken from the word “batangan,” supposedly a cane used in the building of boats. This is contrary to the so-called “historical data” for Batangas City, which claimed that the name “batang” pertained to logs3. Bauan: telegraph and military station at the head of Batangas Bay, 4 miles NW of Batangas. The town contains about 5,000 inhabitants and the municipality 29,659. It has a fine market and is a center of piña cloth embroidery. Calaca: telegraph and military station on the north coast of Balayan Bay, 20 miles NW of Batangas. Population of municipality, 8,228. The town contains about 2,500 inhabitants. There are large sugar interests here, and the town is noted for its cleanliness and healthfulness. Cuenca: 1 mile SW of the shore of Taal Lake, and 10½ miles north of Batangas, at the foot of Mt. Macolod. Population of municipality, 6,375. Population of town, 2,000. Calatagan: near the western shore of Balayan Bay, 16 miles north of Cape Santiago lighthouse and 27 miles WNW of Batangas. Population, 964. Ibaan: military station, 7 miles NE of Batangas Population, 8,900. Lemery: on the NE coast of Balayan Bay, 15 miles NE of Batangas, on the river bank of the Pansipit River, connecting Taal Lake with the sea. Population of town: 13,000. The municipality is a very large one, containing about 60,000 people. The town has fine markets, good schools, large commerce with all parts of the archipelago and with Taal on the left bank of the Pansipit River. If forms one large city of about 20,000 inhabitants. Lian: in extreme western part of the province near the left bank of the river of the same name, 3 miles above its mouth, 3 miles SSE of Nasugbu, and 33 miles NE of Batangas. 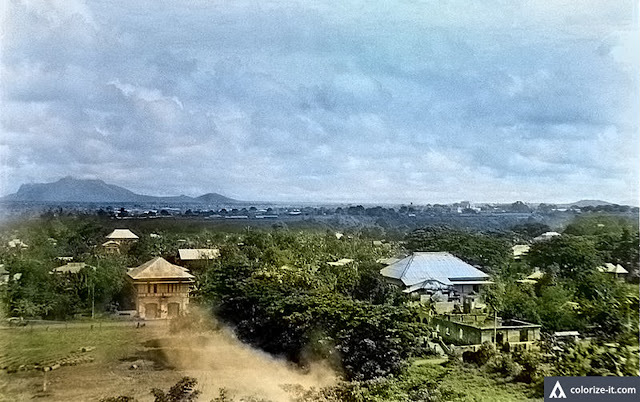 Lipa: telegraph and military station, 15 miles NNE of Batangas. This is one of the largest towns of the province and the seat of important trade, being in wagon-road communication with both Laguna and Tayabas (Quezon) provinces. The principal roads from Lipa in all directions are old military roads, and are in very good condition. They are always passable for loaded wagons. A great deal of sugar, corn and tobacco is produced here. There are also fine schools, drug stores and markets. The town formerly had a weekly newspaper. The people are very intelligent and progressive. Population of town, 14,000. Population of municipality, 40,733. Loboo: (Lobo) on the southeast coast of the mouth of the Pinacanauan River, 6 miles northeast of Malabrigo Lighthouse and 18 miles SE of Batangas. Population 6,472. Mount Loboo or Malagundi, 3,507 feet high, rises 6 miles ENE. Nasugbu: military and telephone station, in the extreme western part of the province, 2 miles inland from the China Sea coast, 85 miles NW of Batangas. It is a port entry. Population, 8,623. Rosario: an important road center 13 miles NE of Batangas. Population of municipality, 12,435. The town was completely destroyed by the insurgents (in reference to the Filipino revolutionaries fighting against the United States Army). San Jose: road, telegraph and military station, 10 miles NNE of Batangas. Population, 10,000. San Juan de Bocboc: on the western shore of Tayabas Bay, on the riverbank of the Sinturis or Lanay River, 1½ miles of the Tayabas boundary, and 25 miles east by north of Batangas. There are two towns, the old and the new, 3 miles apart. The old one is on the bay, and the new one on the river, which is navigable for canoes. Many horses are raised in this vicinity. Population of town, about 2,000. Population of municipality, 14,017. San Luis: on the eastern shore of Balayan Bay, 11 miles NW of Batangas. It is 3 miles from Taal, and has good schools but no church. It is a fishing village and has a population of about 1,200. The municipality has a population of 5,201. Santo Tomas: an important road, telegraph and military station, 4½ miles within the extreme NE boundary towards Tayabas, 25 NNE of Batangas. It is located at the base of Mt. Maquiling, is very healthy and has good schools. Population of town, about 1,500. Population of municipality, 10,769. Taal: coastwise port, telegraph and military station on the left bank of the Pansipit River, the outlet of the great Taal Lake into Balayan Bay, 13 miles NE of Batangas. The important town of Lemery lies on the opposite bank of the same stream. Taal is built of stone, on a high, terraced hill overlooking Balayan Bay. It is one of the largest municipios in the province, and is a very important military station. Population of town, about 6,000. Population of municipality, 33,378. Talisay: on the northern shore of Taal Bay, 1½ miles south of the boundary with Cavite on the north, 26 miles north of Batangas. It is a little fishing village, important only by reason of its location near a pass from Batangas to Cavite. Population of town, about 600; population of municipality, about 8,200. Tanauan: road, telegraph and military station in the extreme NE part of the province near the Laguna boundary, 24 miles north by east of Batangas. It is in a fine sugar country; also a great tobacco and fine fruit country. It is about 2½ miles from Santo Tomas and 9 miles from Lipa. It contains good markets and schools, and the people are very intelligent. Population of town, about 2,000; population of municipality, about 20,036. Taysan: an important road center, near the left bank of the Calumpang River, 9 miles ENE of Batangas. Population of municipality, about 8,971. Tuy: in the western part of the province, connected with Balayan on that bay, 5 miles south by the road. A trail also extends across the sierra into Cavite. It is 28 miles NE of Batangas. It is a small village, surrounded by a good cattle and farming country. Population 10,150. 1 ““A Pronouncing Gazetteer and Geographical Dictionary of the Philippine Islands,” published 1902 by the United States Bureau of Insular Affairs. 3 “History and Cultural Life of Batangas (Town),” online at the National Library of the Philippines Digital Collections. 4 “Report of Lieutenant W. G. Caples, Corps of Engineers, US Army, Upon the Construction of the Calamba-Batangas Road, Luzon, P.I.,” published 1903 in Washington D.C.
5 Probably Kaytinga in Cavite. 5 Santo Tomas was recently elevated to the status of a city.